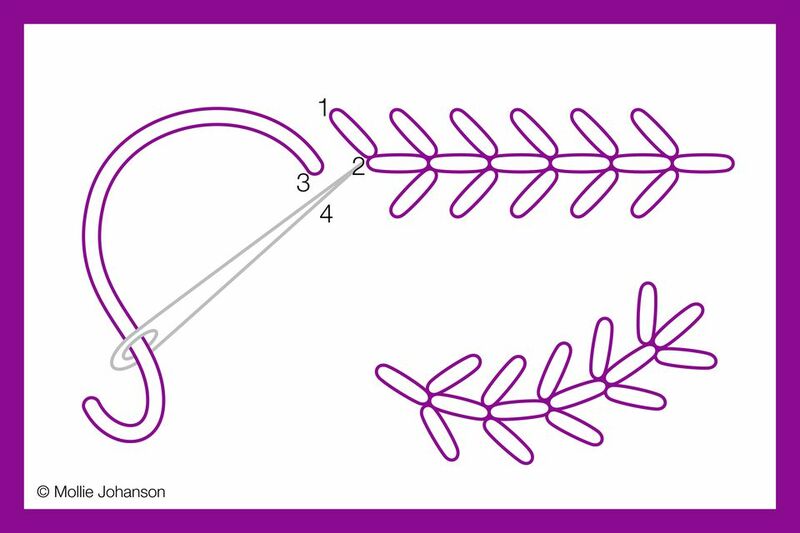 The fern stitch is a surface embroidery stitch used to create an open, lacy stitch along a straight or curved line. It's beautiful worked as tree branches, foliage, ferns, or seaweed in a project. Fern stitch is frequently seen in crazy quilts and it's likely to show up in patterns with natural motifs. To work the fern stitch along a horizontal line, make a diagonal stitch from the upper left (point 1) to the lower right (point 2). Make a second stitch to the left of the ending hole coming up at point 3 and down at point 2, in the same hole as before. Make a third stitch diagonally from the lower left (point 4) to the same ending hole (point 2 again). Continue making this 3-stitch group along the marked lines in your fabric until you have reached the end of the row. If you find that you're having a difficult time getting the spacing even for the three stitches, you may find it easier to work the center stitch first, then the two sides. If your goal is to have precise, symmetrical fern stitch, you can mark the center line as well as a guide line on each side. As you get more comfortable with this stitch, you are less likely to need the extra lines. That said, it isn't necessary to make this stitch look even. Your fern stitch will have more movement and realism if the angled side stitches have some variance in their length and angles. When working it on a curved line, you will almost always need to adjust the angle slightly, and that's okay! If changing the length, spacing and angle of the fern stitch can give your work some realism, altering it even more can give it whimsy. Don't be afraid to go a little crazy with some spiky stitches! This stitch is good for creating various types of foliage, including branches, sprigs of evergreens, and as filler among floral embroideries. You can use it along the center of a leaf to form the veins or on a feather. Adding more stitches along the edges of fern stitch can also transform it. French knots make good berries for evergreen branches. Straight stitches become extra "needles." Even detached chain stitches will work in along a section of fern stitch as tiny flower buds. 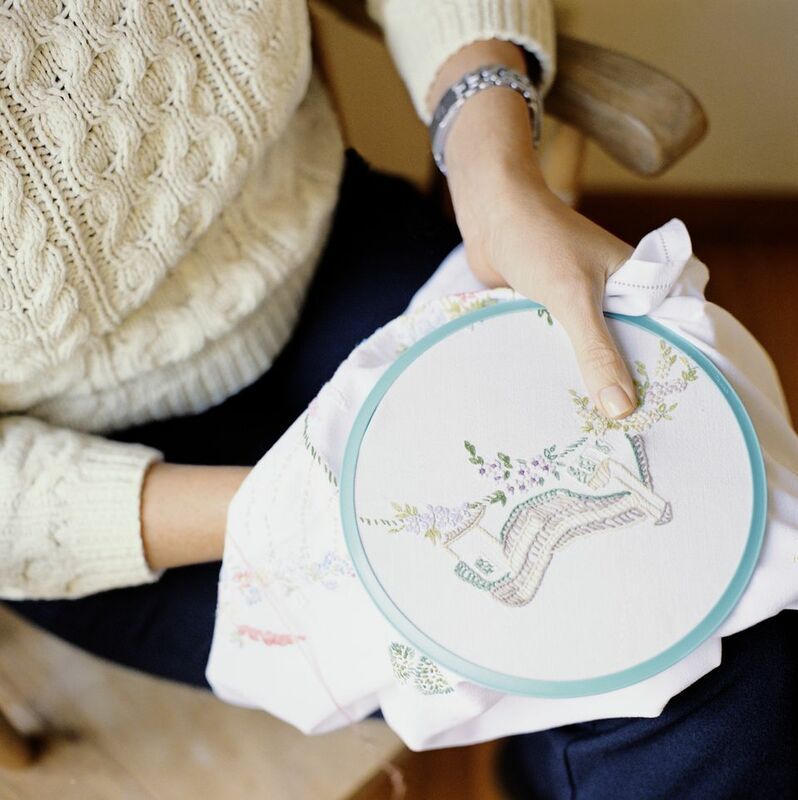 If you're making an embroidered floral display, either with bold, satin-stitched flowers or embroidered felt flowers, try adding fern stitch for a variation on standard greenery. To add some layers and dimension to your fern stitch, you can wrap or weave the center line as you would with back stitch. You can overlap several lines of fern stitch as well, or stitch rows of it as an open fill stitch. Look for more ways that this stitch can work its way into your embroidery!